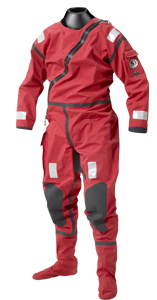 AWS Active Watersport Suit is manufactured for paddling, dingy sailing and for other water sport activities achieved in a sitting position. The simple design concentrates on the most essential features: comfort and keeping dry, leaving out excessive details. The suit design considers especially the different measurements of the back and the front parts, to achieve maximum comfort whilst in a sitting position. Material: Vapour permeable and water tight 4-Tex®. Seam construction: double seams that are heat seal taped and reinforced to be 100 % watertight. Reflective tape: The suit is equipped with several reflective tape in the correct place, which assure’s visibility in all conditions. The soft and durable reflective tape have been developed by 3M in accordance with the directive on marine equipment. Neoprene neck seal and wrist seals keeps your body warm in cold conditions. Separate neoprene thermal hood and gloves protects your head and hands against cold water. The gloves are 5-finger type.